If you want a bargain supermini with a dash of character, the Suzuki Swift is hard to ignore. This low mileage one owner model is finished in red with LED daytime running lights. This would make an ideal first car with its low running costs low tax and insurance. This car is supplied with a full mot 3 month RAC warranty and 1 years RAC breakdown cover. The Suzuki Swift is a common sight on UK roads and for a good reason. This sporty, good-looking hatchback is available with either three or five-doors and is lots of fun to drive thanks to agile and responsive handling. 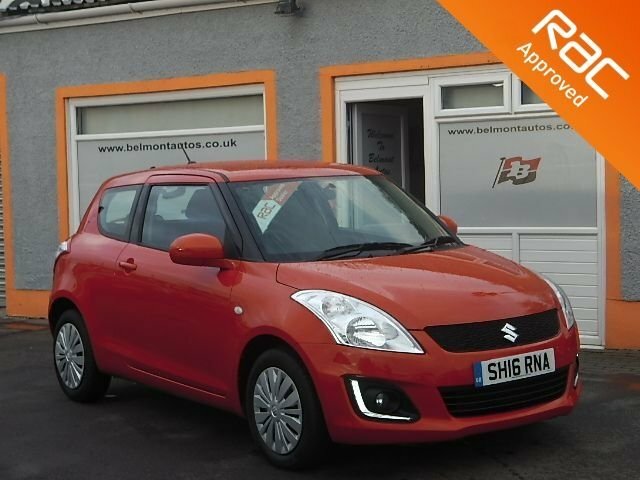 You'll find a great range of used Suzuki Swift models for sale in Lanarkshire with the help of Belmont Autos, all of which are reasonably priced to suit a range of budgets. Why not take a look at our latest stock online before contacting the team to book a test drive in the model of your choice. Rest assured we always go the extra distance to ensure that our customers find the right used vehicle to suit their needs.